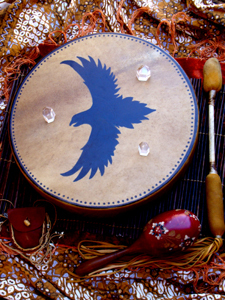 Quynn has been hosting shamanic journey circles and Shamanic Workshops for personal development and Spirit World Connection since 1999. She has gathered information from her own experience, her Spirit Guides, and her research to create each circle. To date, Quynn has hosted many hundreds of circles and workshops, where she sat in circle with many people of all walks of life. Her purpose is to provide a sacred container for each participant to connect with their inner world, in a very personal way that helps them in that moment. From beginner to practitioner, Quynn shares her intuitive and multicultural approach with whomever shows interest. To find out details about upcoming offerings with Quynn, please go to her meetup group. Or go to the events page at ShamanWorld.com. Quynn’s group container held space for spontaneous and miraculous spiritual healing for me of the most profound type. Quynn’s encouragement of me to doctor myself during journey practice allowed the information in my subconscious, nervous system and DNA to come into the present, be awakened and integrated in to my present life experience freeing me from old patterns and addictions. 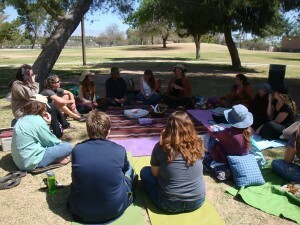 Quynn will create a custom shamanic circle for you and your friends, family or co-workers in Tucson, Arizona. One time or a series. Her site or yours. Contact Quynn for details.